June 19, 2012 - When the CEO of the Genesee Country Village & Museum set out last year to build and fly the world's first replica of a Civil War manned balloon the “Intrepid” little did he know his dream could collapse from a nationwide helium shortage. But he also didn't bargain that one of the country's most iconic retailers would step forward to deliver a miracle at the last minute, literally raising the project off the ground. Thanks to the generous support of Macy's a brand synonymous with the giant helium-filled balloons that grace Manhattan's skies every Thanksgiving morning the Intrepid will begin flying this July 4 outside of Rochester, N.Y. Weather permitting, the balloon will take guests 300 feet (32 stories) into the sky, simulating what some of the world's first military pilots (a.k.a. aeronauts) experienced 150 years ago. The Intrepid was a hydrogen gas balloon or aerostat built for use by the Union Army Balloon Corps for aerial reconnaissance purposes during the American Civil War. It was one of seven balloons constructed for the Balloon Corps and was one of the four larger balloons designed to make ascensions to higher elevations with a larger lift capacity for telegraph equipment and an operator. 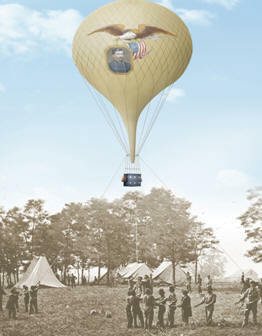 It was the balloon of choice for Chief Aeronaut Thaddeus Lowe overlooking the Battle of Fair Oaks. The fateful flight over the Battle of Fair Oaks was instrumental in saving the fragmented army of Union Army General Samuel P. Heintzelman from what would have been sure defeat at the hands of the Confederates. The Intrepid undergoing a lengthy inflation was quickly hooked up to the spout of the smaller Constitution by means of a de-bottomed camp kettle by which the gas was transferred in shorter time to make the ascent. "We were looking for a miracle. The Museum was seemingly out of options to secure helium after having placed innumerable calls to dealers, government officials and even decommissioned research laboratories across the U.S.," said Peter Arnold, GCV&M's CEO and president. "Then we heard from Macy's, which was able to donate the 50,000 cubic feet we needed. We're simply ecstatic, as we were within days of having to suspend our opening. 'The Magic of Macy's' has never been more real." First announced this past February, the Intrepid project has captured the imagination of families, educators, historians and aviation enthusiasts across North America. Renowned documentary filmmaker Ken Burns and adventure balloonist and Virgin Group Chairman Sir Richard Branson have both praised the historic reconstruction. "Supporting education is an important aspect of our community giving, made even more relevant in this case since Macy's was founded during the Civil War era," said Russell Schutte, senior vice president, director of stores, Macy's Midwest. "With our unique connection to helium ballooning, we had the opportunity to help Genesee Country Village & Museum fulfill its dream to open this one-of-a-kind, interactive exhibit. The result will benefit not only the people of Western New York, but visitors who will travel from across the U.S. and overseas to experience the wonder and history of flight." Featuring its signature giant helium character balloons, the 86th Annual Macy's Thanksgiving Day Parade takes place on Thursday, November 22. Conceived by Professor Thaddeus Lowe, the Union Army Balloon Corps was personally approved by President Abraham Lincoln in June 1861. Not only was the Intrepid the predecessor to modern-day military aviation, but it also foreshadowed the future of military reconnaissance communications. The pilot would send intelligence information troop movements, artillery compensation instructions, and more to soldiers on the ground via telegraph. Like the original seven gas balloons used by the Union Army during the Civil War, the Intrepid is tethered to land for optimal convenience and safety. Visitors -- up to four at a time -- will have the opportunity to take 15-minute flights for a nominal cost in addition to their museum entry fee. A team of prominent advisors is assisting with the project, including Tom D. Crouch, Ph.D., senior curator of Aeronautics for the Smithsonian Institution's National Air and Space Museum; Jim Green, director, Planetary Science Division, National Aeronautics and Space Administration (NASA); and Rob Shenk, director, Internet Strategy & Development, Civil War Trust. Genesee Country Village & Museum helps visitors understand the lives and times of 19th-century America through interactive programs, events and exhibits. It is the largest and most comprehensive living history museum in New York State and maintains the third largest collection of historic buildings in the United States. The 700-acre complex consists of 68 historic structures furnished with 15,000 artifacts to provide an authentic 19th-century environment in which visitors can interact with knowledgeable, third-person historic interpreters in period-appropriate dress.